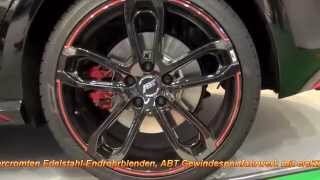 German tuner ABT Sportsline unveiled its upgrade kit for the Volkswagen Golf GTI 2013, called the ABT VW Golf VII GTI 2013 at the 2013 Geneva Motor Show. The ABT Golf VII GTI is a perfect car that leaves nothing to be desired. Engine upgrade include the 2.0-liter turbo engine, which now develops 270 HP (199 kW) instead of 230 HP (162 kW). ABT Sportsline is working on the second, even more potent stage of expansion, an upgrading to as much as 310 hp (228 kW). 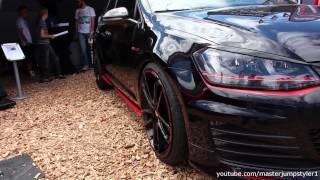 The ABT Golf VII GTI has been made dynamic or sporty. Front spoiler and front grille underline the strong charisma. Mirror caps and side skirts form a sort of attractive connection with the rear, which, in turn, with its rear skirt insert and trunk lid attachment radiates unobtrusive dominance. The four-pipe exhaust system is a typical ABTdesign element. 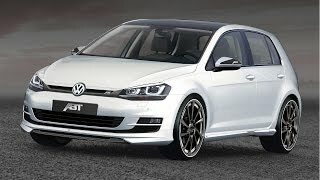 The ABT programme for the VW Golf VII GTI is completed by suspension springs that lower the CoG and even increase the serial version’s roadholding capacities. Customers will have the possibility to choose between two different wheels, measuring 18 or 19 inches.